Someone please help me out here. Give me some ideas of ways to diagnose and improve my 25yd freestyle accuracy. Below you can see 5 shots at 10, 5 shots at 15 and 5 shots at 25. 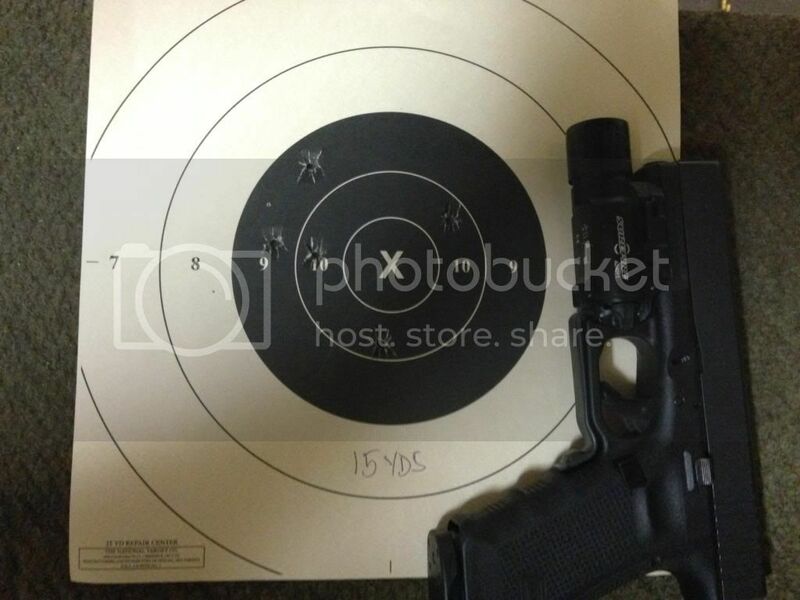 It seems to me that the 25 yd stuff is disproportionately bad compared to the 10 and 15 yd stuff. I don't see any major red flags in either of the two closer groups that would indicate that a 25 yd group should be that bad. What gives? All shots at 25 felt good in terms of trigger control. I'm no expert but If I was your shooting buddy I would tell you to focus better on the front sight an go from there. How often do you shoot slow fire accuracy-related drills? How well are you focusing on the front sight? Given your 25 yard shots "felt good," what is your skill level in terms of calling your shots outside of the black? Are you pulling only with your trigger finger or are you squeezing with your whole hand? Are you snatching when the front sight looks good or are you accepting the wobble zone and conducting a purposeful skilled trigger press? If you're not seeing improvement after keeping these questions in mind and continuing your own practice, ball and dummy drills with a friend (loaded one at a time outside if your view) can be illuminating. It shoot Ameriglo Hacks which I believe has the same width front sight as the caps? 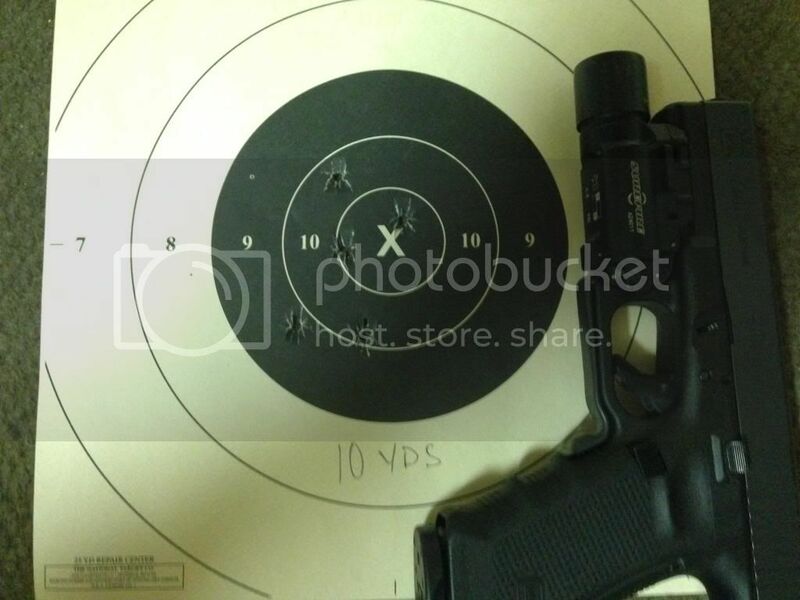 Anyway, I find the Hack sight very wide for shooting B8's at 25 yards. It almost fully covers the 9 and 10 rings. There's only been a couple times where I've kept the majority of my shots in the black. I shoot 10 shot groups, and an 8.5x11 version of the B8, but I still find it very, very difficult. Repeat with ball and dummy, lots more dummy than ball, short range and then extend as you tighten them up. Don't feel bad, this is what I shot cold a few days back at 25 yards with my barely broken in stock Gen 4 G17 standing unsupported. The good news is that it woke me up that I need sights and a quick polish job, and that I need to actually practice to stay consistent. I would say ball and dummy (as in 2/3 dummies and 1/3 live in no particular order) and stick with 25 since you do fine at closer distances. Really get into the zen of perfect and consistent front sight focus, sight picture, sight alignment and consistent trigger press. Ensuring you are at a solid and stable NPOA and timing your shooting to coincide with the same moment in your breathing will help too. 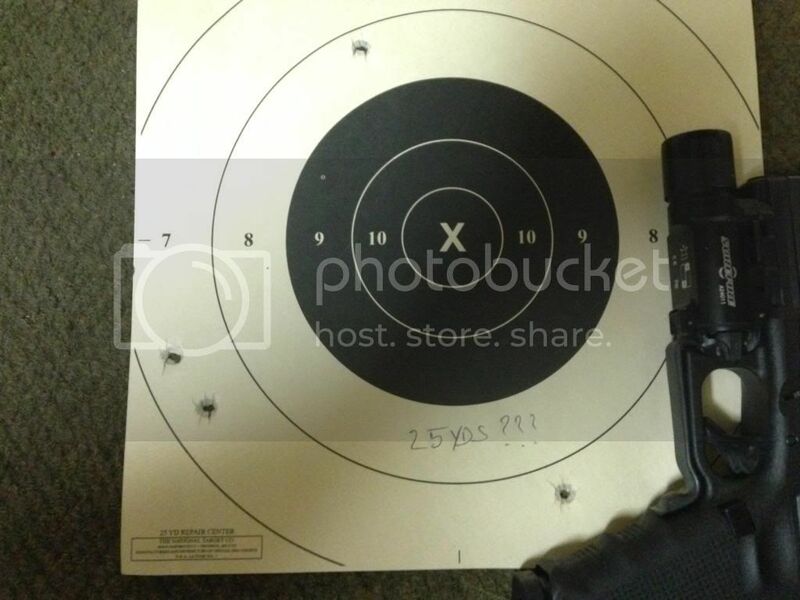 The 25 yd group is not disproportionately bad. Consider the angles that those variations from pure perfect are to have a 10 yard group as you have and extend those angles out to 25 yards. Bill Rogers believes the way to ball and dummy is to alternate ball, then dummy, not mix them randomly. Feels that leads to better results, quicker. Did he elaborate as to why?